Many people think that if you’ve seen one sprinkler system, you’ve seen them all! While this may appear to be the case, these systems are highly engineered and should be designed specifically for what you are doing in your building. Here are some key points about sprinkler protection and why this issue could be costing you a lot of property premium dollars. What was your sprinkler system originally designed for? 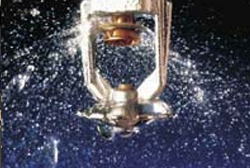 Sprinkler systems are supposed to be designed to put out a density of water that has been proven to control a fire. Do you need the same density to control a fire in a metal working shop as you do in a plastics warehouse? NO!!! The National Fire Protection Association has done a great deal of research to find out what sprinkler designs protect a given building occupancy. The process starts with a sprinkler contractor knowing what will be done in a particular building. Problems arise when people move out of a building and a new tenant or owner comes in. Other problems occur from a building owner or tenant doing something in the building that they weren’t doing when the sprinkler contractor originally designed their sprinkler system. The result? Your sprinkler system may not be able to control a fire in your building! First and most importantly, you should care because your entire facility may be at risk for a fire loss. The beauty of properly designed sprinkler systems is that fire is controlled in a relatively small area with minimized damage. If your sprinkler system design is inadequate, you may be looking at a total loss of the building and all its contents. You may be covered from an insurance standpoint, but is this something you want your company to go through? Secondly, most insurance companies use preferred rates for those facilities rated as "sprinklered". If your system has an inadequate sprinkler system, you could be getting charged the same rate as a building having no sprinkler system at all. To get the sprinklered property rates you deserve, you can figure out an approximate pay back period for work needed to upgrade your sprinkler system.